Nicholas County High School’s secretary Mrs. Ann Lahnam and her husband Mr. Jack Lahnam have been playing Ms. Claus and Santa for our community for 36 years. It started with their neighbor recommending Mr. Lahnam to be Santa. He did it for a year by himself and then he ran into a Mrs. Santa Claus outfit, so that is how Mrs. Lanham became Mrs. Santa Claus. For the past 3 years on the 2nd Monday of December, the Lahnams visit the Second Avenue Community Center in Charleston where they help throw as Christmas party for the homeless children as Mrs. Claus and Santa. Mrs. Lahnam and her husband receive the Volunteer for Victims Award and The Foster Family and Friends Award. They also recieved a small plaque from the United States Department of Justice. Mrs. Claus & Santa, over the years, have traveled to Morgantown, Beckley, and Charleston to spread the spirit of Christmas to children. Ever since they started in 1981, they say it will be the last year they will volunteer, but then they start getting calls and requests for Mrs. Claus and Santa, and they can’t say “no.” Mrs. And Mr. Lahnam say they will be Mrs. Claus and Santa until they can’t do it anymore. 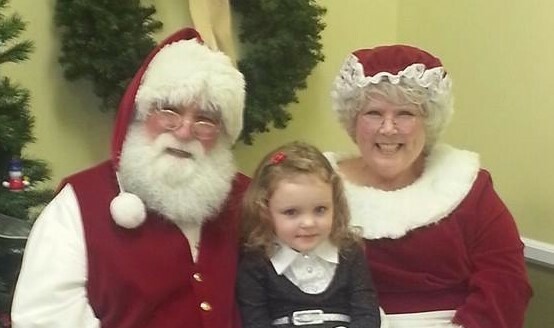 Nicholas County High School is proud to have our very own Mrs. Claus and wish her and Santa many more years of bringing the magic of Christmas to the children of West Virginia!